WASHINGTON (Reuters) – The Trump administration ratcheted up pressure on Venezuela's President Nicolas Maduro on Wednesday, announcing U.S. recognition of the country's opposition leader as interim president and signaling potential new sanctions against its vital oil sector. The administration had been waiting to issue its announcement after Guaido had been sworn in as the country's temporary president on Wednesday, people familiar with the matter told Reuters. 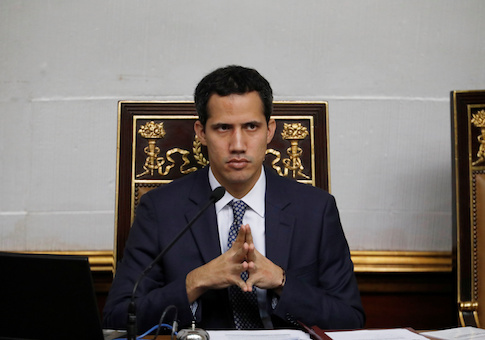 The sources acknowledged that formal recognition of Guaido would be complicated by questions of how to deal with Venezuela's U.S.-based diplomats. Such a move could also backfire if Maduro took action to prevent Guaido from being sworn in or used it as a pretext to detain him again. Adding to pressure on Maduro, multiple sources said the Trump administration could impose new U.S. sanctions on Venezuela's vital oil sector as soon as this week if the political situation there deteriorates further. U.S. officials are considering a range of potential measures, including restricting U.S. imports of Venezuelan oil or even a full ban, to punish Maduro's government but no final decisions have been made as Washington closely watches the street protests unfolding in the country, two people familiar with the matter told Reuters. This entry was posted in National Security and tagged Venezuela. Bookmark the permalink.